Brotherhood Crusade Chairman, Los Angeles Sentinel and Los Angeles Watts Times Publisher Danny J. Bakewell Sr. demand for an independent hearing into the California Highway Patrol officer Santa Monica Freeway beating of Marlene Pinnock was held on Tuesday July 20 at Southern Missionary Baptist Church in West Los Angeles. Bakewell held a press conference several weeks ago requesting that an independent investigation into the July 1 beating of middle aged pedestrian whom the white CHP officer pummeled. This week Assembly members Sebastian Ridley-Thomas and Reginald Jones-Sawyer heard public testimony from behavioral and mental health experts and law enforcement officials examining police protocols and procedures for interactions with mentally ill persons. “We are trying to make sure that folks are clear their government is responsive to the needs of those who are concerned about safety,” Ridley-Thomas told the LAWT prior to the hearing. He explained that the community advocacy piece is the reason why the hearing was being held. “If it wasn’t for community groups of strong and engaged guidance such as Mr. Danny Bakewell in particular, then we would not be having this conversations<” Ridley-Thomas stated. Three panels of experts testified to the Assembly Joint Hearing of the Assembly Select Committee on Mental & Behavioral Health chaired by Ridley-Thomas and Assembly Select Committee on Justice Reinvestment co- chaired by Assembly member Jones-Sawyer. 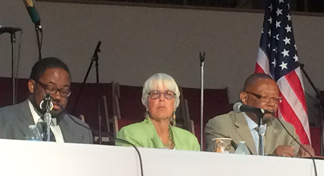 The Assembly Joint Hearing was held at Southern Missionary Baptist Church in Southwest Los Angeles. Assembly member Jones-Sawyer, co-chair of the Assembly Select Committee on Justice Reinvestment and chair of the Assembly Budget Subcommittee on Public Safety, said, “We’ve spent the last two years trying to correct two generations of public policy that criminalized persons suffering from mental illness. It’s time for California to get smart about crime prevention, mental health intervention, and behavioral health rehabilitation,” said Assembly Member Jones-Sawyer.